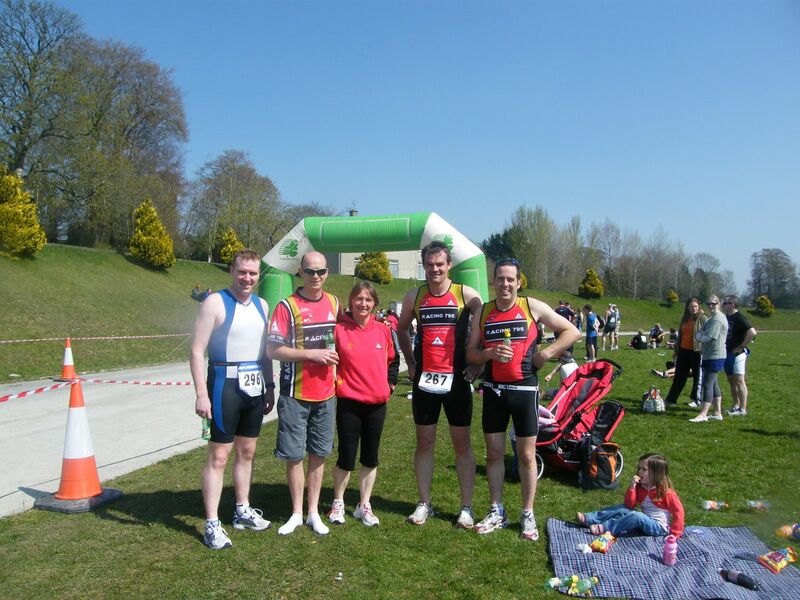 Saturday 17th April saw the start of the National Triathlon Series , the now popular North Tipp Sprint (750m/20k/5k) was held in Nenagh. Racing 795 was out in force with four seasoned members – Don Morrissey, Barry Byrne, Martin Mimnagh and David Furlong and one debutante Joy Furlong attending. It was a fabulous morning with clear skies and the sun shining had all in good and hopeful spirits. As it was a pool swim the start was prolonged for some of the lads but they busied themselves cheering on the others. First off were David and Joy, with the more experienced swimmer exiting the pool first, David was off to a flying start setting the tone for the day. For Joy the swim was not easy and she exited the pool with relief to have finished it. Don was off in wave 5 after a long wait but it did not deter him, he swam well in a time of 13:27 . Just stopping short of the elite wave were Martin and Barry with both of them producing excellent swim times. And on to the Bike! Transitions were brisk and for all it was out onto a changed bike route. It was hilly in places but more focus was on avoiding the many marked potholes, the force of winter still evident. Heads were down and all focused, pushing really hard to make all that TT training over the winter pay off. The men had things to prove! First home was David who was quickly into his running stride proving that four months free from running does have its benefits, he crossed the finish line a minute and a half better than last years run time for a total of 1:23:41. Joy finished next after an enjoyable run in a highly respectable 1:42:23 on her debut. Martin looked driven as he returned from the bike leg into transition 2, and in no time was pushing it hard on the run, crossing the line in a time of 1:12:38. More in the tank from martin no doubt as a stitch slowed progress a bit in the run. Barry returned from the bike route with all guns firing, his trick with the elastic bands on the bike shoes worked a treat! No time was lost before he was out on his run giving his family a big wave as he zipped by. He crossed the finished line relieved as the cold he was trying to keep at bay had taken hold making his first of the season not the most enjoyable one. As a first time experience the North Tipp Sprint is certainly a good one, very efficently run, hey they even organised the weather. It would be hard not to enjoy yourself in conditions such as we had. As always a huge thank you has to go to the support crew, the encouraging words and loud cheers really do push you on and would be sorely missed if those kind minded people did not attend. So thanks a million Lorraine and girls and also to the Furlong/Kelly crew.